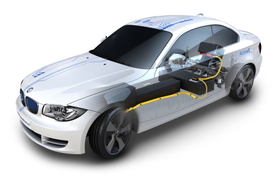 BMW is testing its future electric powertrain in the ActiveE concept (shown). MUNICH – BMW AG will produce its electric-car range at its plant in Leipzig, Germany, the automaker announced on Monday. In addition, German factories in Wackersdorf and Landshut, both in BMW's home state of Bavaria, will make parts for the so-called Megacity Vehicle. The first Megacity cars are due to come off the line in mid-2013. BMW plans to launch an entire family of electric vehicles from the Megacity subcompact, which is designed for major metropolitan areas. BMW hasn't decided on a production name for the car. At the Detroit auto show in January, BMW presented its ActiveE concept, an electric-drive vehicle based on the 1-series coupe. Next year, BMW development chief Klaus Draeger plans to launch another test fleet of electric cars based on the ActiveE. Draeger wants to use the cars to test the electric powertrain for the Megacity vehicle in a pre-production trial. BMW is sourcing the lithium ion batteries for its new city car from SB LiMotive, a Robert Bosch-Samsung joint venture. BMW will build the cars in Leipzig because it is the company’s most flexible factory and is also in position to rapidly add capacity, a company source told Automotive News Europe sister publication Automobilwoche. BMW had said that other countries were in the running for the car, although BMW production chief Frank-Peter Arndt admitted to Automobilwoche that he had a preference for locating the output in Germany. Proximity to product development facilities would be "helpful" for the execution of the new vehicle concept, he said. In October, BMW formed a joint venture with Europe’s sole carbon fiber manufacturer, the SGL Group. The partners’ joint venture, SGL Automotive Fibers GmbH & Co KG, will make what is called carbon fiber fabrics, which can be best described as a weave of carbon fibers that has not had a stabilizing resin injected into it. This work will be done at the joint venture’s plant in Wackersdorf. The material will be turned into CFRP (carbon fiber reinforced plastic) parts at BMW’s technical center in Landshut. A BMW spokesman said it is too early to say which of the Megacity's components will be made from the lightweight, durable but expensive material. However, he promised that BMW’s use of carbon fiber would be unprecedented for a mass-market production car. BMW is developing environmentally friendly cars as a part of its so-called “Project i,” a unit developing low-emission, highly fuel-efficient concepts. The electric Mini, which emerged from Project i in 2008, is now being tested with a fleet of 600 vehicles.